My sister Linda had always been a sassy, spunky gal, but in early July I got the call that Linda had been diagnosed with lung cancer (yes, she was a smoker), and was to undergo Chemo right away. I hopped on a plane to Toronto to spend time with her while she underwent her treatments. Before I left home I grabbed a skein of handspun, and my crochet hook, intending to keep my hands busy and to make a shawl or blanket for Linda’s recovery. 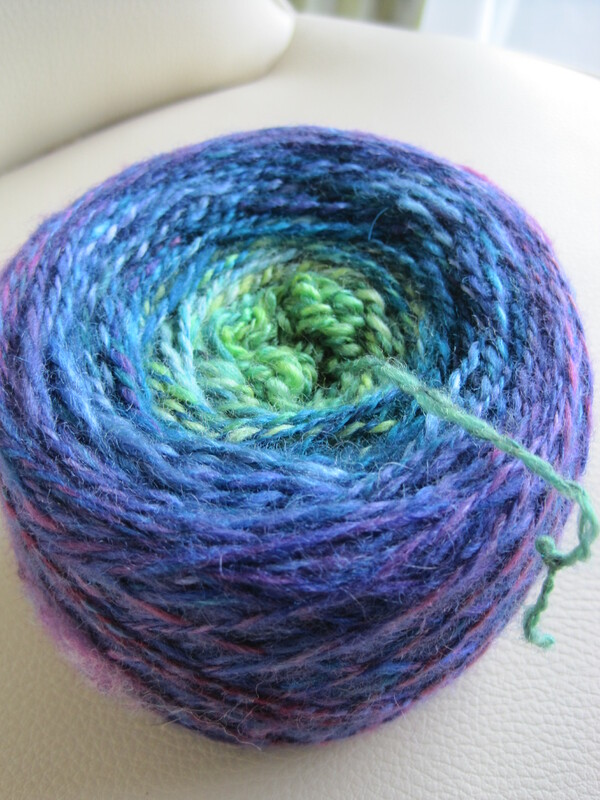 This is a very pretty Merino silk blend, spun 2 ply, and spun to move the colours from green-turquoise, through turquoise, blue and into purple-blue then purple. Calming colours of ocean and sky. I started crocheting on the plane, touched down and rushed to the hospital to meet the rest of the family and received devastating news. Linda needed emergency surgery to repair a tear in her bowel, and although she struggled bravely to recover, her body was not strong enough. I had only a few days to be with her and then she was gone. Now, instead of a blanket for Linda, this became a blanket of memory of Linda. 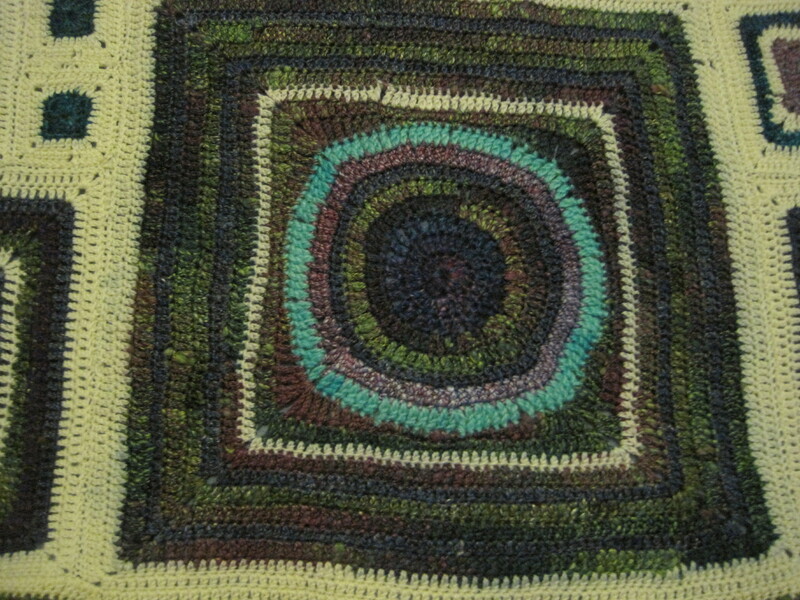 I continued to crochet, and as I made the squares, I thought of her, and the threads of our lives. Linda and I were so close in age, and as sisters, we had a special, shared childhood, we were innocent together. We shared a bed for most of our growing up years, and shared secrets and laughter and love as we whispered into the night. From first tooth to first lost tooth, first love to first lost love we laughed and cried. We shared dresses and dreams. As adults we followed different paths and different lives and lived so very far away from each other, but family gatherings brought us back together and we stayed connected. As I continued to crochet, thoughts of Linda were never far, and as I quickly used up the first skein, I added in more and more balls of handspun, reminding me that we are connected by threads to each person in our lives. I worked through my grief and my recovery and I learned to slow down and appreciate every thread, both in the blanket and in life. 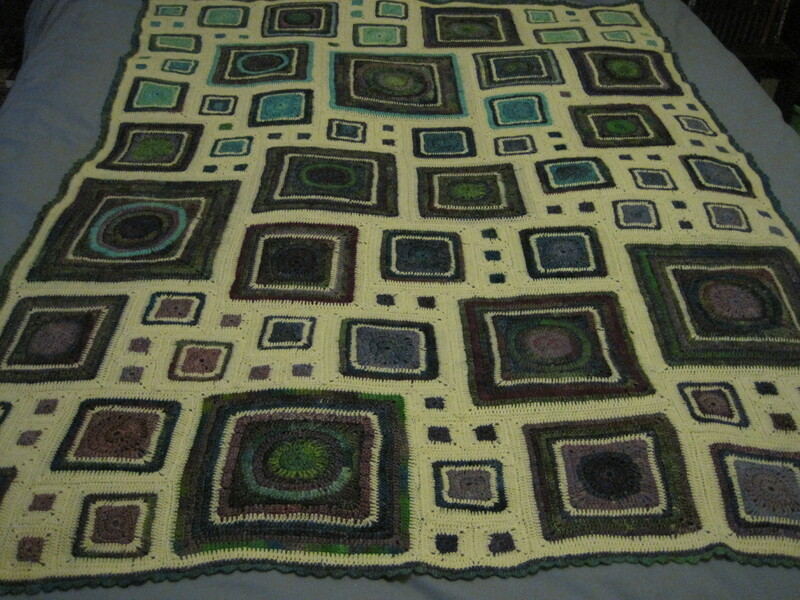 And now I have a beautiful blanket to wrap around me on a cold winter night. A blanket that is soft, and warm and comforting. Linda, this is about you. I love you, and I miss you, and you will stay in my memory forever. 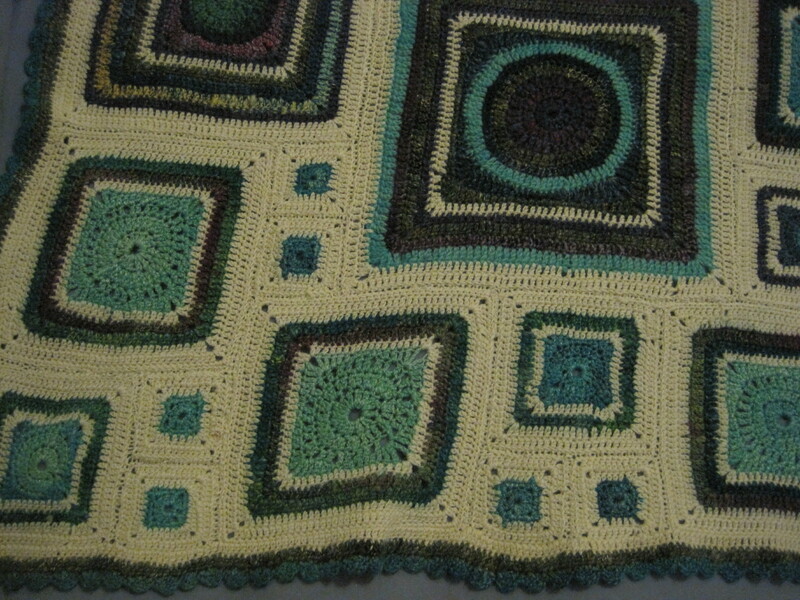 This entry was posted in Essays, Spinning and tagged crochet, handspun, sisters. Bookmark the permalink. Thanks, Vicki. You know sisters are special. What a post! So beautifully written to capture your love and loss–really compelling. And the blanket is simply fabulous–you’ll always cherish it and i bet it’ll become a family heirloom. Thanks, Kerry. It is so soft and amazing, and should last a long time. My daughter has her eye on it. I am an only child…but wept like a little girl to read your story. Not all in sadness, either. While it’s wrenching to read the depths of your loss, reading your expression of your relationship–your explicit understanding of it–tells me that with it, you gained what never can be lost. Thanks for your kind words, which touched me and reminded me of the strength of human connection.